Pet Store Babies or Adopted Adults for Your Cages? This is the second part of a series based on efforts by one of California’s top bird rescue organizations known as Mickaboo. There’s a bit of a moral battle going on among companion bird owners: To buy a baby from a breeder or pet store, or adopt an older bird, often from a bird rescue. Certainly, the lure of a fledgling drives many would-be owners that way. But contrary to some perceptions, adopted birds aren’t permanently “marked” by their previous owners. Plus, their life cycle can more closely match the new owner’s since they are past many of the often jarring “baby” behaviors. For example, most avian rescue centers have birds with many different histories in their cages. Bird adoption is an often-overlooked alternative to pet store purchases, and presents a way to allow caring, quality bird owners to adopt a truly magnificent creature to inhabit homes and cages. Birds adopted through reputable shelters can offer their owners the same companionship as those obtained from a pet store, and owners can gain the soulful satisfaction of knowing they are helping desperate animals who might otherwise be lonely, neglected or left for dead. Mickaboo Companion Bird Rescue is an example of this loving relationship between “abandoned” birds and their new owners. Mickaboo accepts all kinds of birds and will rehabilitate them if they are given up due to a behavioral or health problem, although these aren't always the reasons for their surrender. Unfortunately, excessive breeding practices have increased bird accessibility, thereby feeding a romanticized portrayal of bird ownership that entices unprepared individuals, so even basic care can sometimes prove too much for a newly minted bird owner. As Mickaboo’s Director, Tammy Azzaro, explains, “There are many different types of people who make good candidates for adoption.” Her job is to make sure a genuine desire exists to provide a healthy environment, which includes a proper diet and stimulating cages. Birds exhibit behaviors that may be difficult to interpret for novice and experienced owners alike. Tammy says, “The best bird owners understand the importance of studying avian body language so they are able to better care for their birds.” Tammy admits that Mickaboo has had to turn down a few people who weren't able to provide a proper home for their birds. In these cases, the owners were either not financially committed to bird ownership, or their lifestyle or work schedule was incompatible with the demands of the birds they were interested in adopting. Tammy explains that each bird comes with different care instructions; for example, Lorikeets have very specific diets, and Moluccan Cockatoos tend to be noisy and wouldn't be ideal for someone living in an apartment. Mickaboo works hard to pair birds successfully with each interested owner and this includes requiring them to attend a bird education class that prepares them for all of the necessary care. Adoption has one weighty advantage over a sale from pet store cages: Bird adoption offers a support system before and after bird acquisition. For example, Mickaboo's bird education class prepares potential owners with care instructions specific to their birds and is required of all adopters, regardless of their experience levels. Patti, an administrative volunteer at Mickaboo, explains that sometimes it is hard to convince former bird owners that a class is necessary, but she says "they show up at the class and find out things they never knew, even after years of bird ownership." Mickaboo offers this class to fill in gaps of knowledge that potentially contribute to surrender. Patti says, "There is an amazing patchwork of some knowledge and some non-knowledge out there in the world as it stands, so to have some consistency and give people all of this really powerful information to be able to manage their birds properly and keep them healthy and happy is just fantastic." The information gained from these classes and the center's staff ultimately leads to more successful, healthy pairings. Theoretically, adopted birds will have less health problems than birds obtained from pet stores because owners will already have all of the information they need to maintain proper avian health. Rescue centers can also offer specific information obtained from the birds' previous foster owners or anyone who worked with them during their time at the shelter. Owners can discover specific personality or behavioral quirks and learn management and handling techniques that have already been proven successful in the center's cages. Bird adoption centers like Mickaboo will also hold events where previous adopters can come and speak with potential candidates about the positives and negatives of the process, and they even provide ongoing support after the adoptions, offering any guidance new owners may need to care for their birds properly. Tammy says, "We give you all the information you need so that you'll have the best start with your pet." Mickaboo's foster care network gives hundreds of birds a chance at healthy living each year. The goal of the foster care program is to provide temporary living for needy birds in healthy, stimulating cages. Bird adoptions can occur as early as a few days of entering the foster care program or as late as a few years, and dedicated volunteers are necessary to care for these birds during the transition times. Another benefit of the foster care program is that a bird will have an engaged owner for a period of time who can communicate very specific information about that bird to its new owner. The more prepared an owner is before adoption, the more successful the placement is likely to be. Why is the bird up for adoption? What types of behavioral problems does the bird have and what are some successful techniques for correcting them? What does the bird's diet consist of? How is the bird bathed? Are there any specific toys the bird especially enjoys or any it is fearful of? Does the bird use a cage cover at night? Who is the bird's avian veterinarian and when was its last checkup? Are there any special techniques used for encouraging the bird to enter or exit the cage? What are some of the bird's favorite activities? What causes the bird anxiety? Has the bird lived in different cages? Birdcage histories and behavioral records may be available. Many people choose to adopt a bird rather than buy from a pet store because of the wealth of knowledge and training available, and, ultimately, they find it a truly rewarding experience. Pet stores are in the business of moving birds and may not necessarily take the time to make sure buyers are prepared for the birds that leave their cages. Bird adoption agencies care enough about their birds to rescue them from unhealthy situations and find them happy homes. Tammy admits that some people can never be convinced to adopt, but because the need is so great, Mickaboo will continue to work tirelessly at rescuing desperate birds, fueled by the joy gained through the rehabilitation process. Patti describes their mission well, simply stating, "It's just very rewarding to see a bird thrive." The first photo shows parrots likely ready for sale in a street market in Thailand. The second a teenager here in the US playing with a "handful" of parrots under her care. 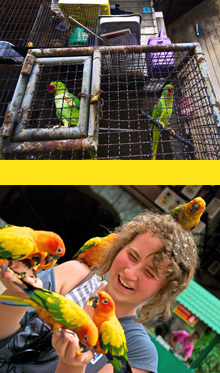 These two photos underscore the fact that an average parrot will spend its lifetime in 4-7 different homes or cages. Bird adoption can lead to more successful placements than pet store purchases because of the carefully-planned transitions and clear communication regarding bird care. One of the most often encountered problems with rescued birds is placing them in cages that are too small. 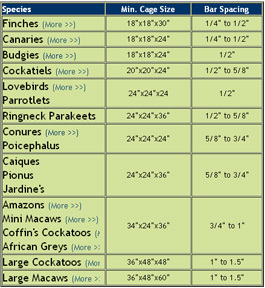 Check out this handy guideline for minimum cage sizes for common companion bird breeds.